My informative book (second edition), featuring many as yet unpublished facts and numerous illustrations, can be obtained direct from ACC ART BOOKS. 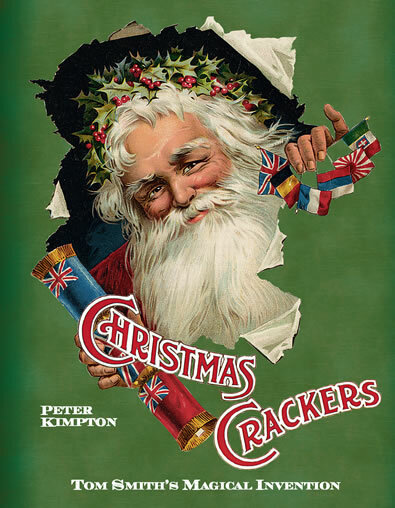 Over 80 pages containing yet more comprehensive and interesting details of the history of the Christmas Cracker. Specially put together for schools, social groups and general study in black and white loose leaf A4 size - £15.99 +P&P. Why not book my colourful, fully illustrated, amusing and informative lecture presentation to find out even more about the amazing history of Tom Smith, his family, his products and the history of the Christmas Cracker in general UK and International enquiries to speak always welcomed. Any queries regarding Christmas Crackers? Email me your interest or questions. By telephone: from outside the UK +44 (0) 1603 437555 or UK (01603) 437555 or write: Peter Kimpton, Squirrel Hill, 18 South Avenue, Thorpe St Andrew, Norwich NR7 0EZ, Norfolk, England. (Don’t forget to include your full address including postal or zip code, email address and/or contact telephone number). Sandy Lane, Old Martlesham, Woodbridge, Suffolk IP12 4SD. 2) Absolutely Crackers: at www.absolutelycrackers.com - A well known company, who offer a wide range of quality crackers to suit all tastes and budgets. Another quality company, also offering Crackers in a range of sizes and choice of contents. 4) Go Crackers: at www.gocrackers.co.uk Offering high quality Luxury, Wedding, Party and "Fill your own" Crackers-especially for you. A huge choice. Looking for a real plus in promoting your products? Why not consider “ADDED VALUE” packs which combine your own products with Crackers for the Christmas market. I am always interested to view or acquire any antique Christmas Cracker material such as Tom Smith’s, Caley’s or Sparagnapagne Cracker boxes (with or without contents) and also period UK or Export trade catalogues for those same three companies. Sadly, the great Tom Smith Company finally passed from direct family possession in the 1930's when it was acquired by the CLARNICO Company (remember CLARNICO Mints?). Today there is no family connection whatsoever and following several "buy outs" and Company failures over the years, the Tom Smith name now lives on purely as a brand and marketing tool under the ownership of the International Greetings Group.